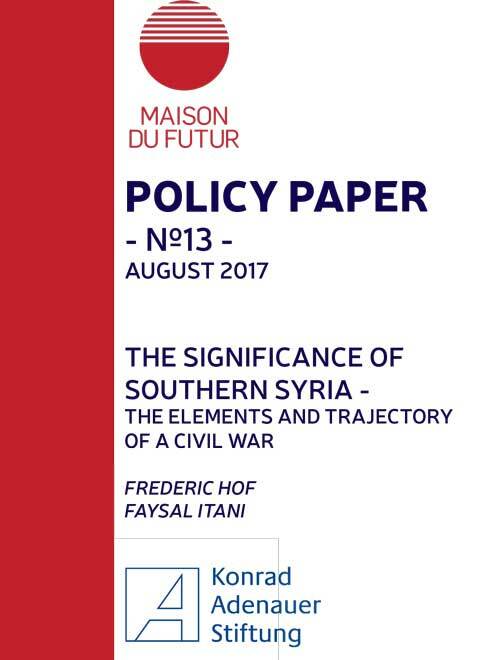 Southern Syria is, in short, a test case for the balance of intentions and capabilities in Syria. Can Russia restrain the regime and Iran from trying to retake the area? Will the United States play an active role to that end? The answers will help determine Syria’s fate for the foreseeable future. The war in southern Syria gets less media and analyst attention than Syria’s northern conflict areas. Yet the struggle over the south is at least as important as the northern war’s high-profile Turkish ground incursions, Russian air campaigns, and US-led war on ISIS. It is also just as likely to trigger international conflict and transform the region’s geopolitics. Despite recent ceasefire agreements brokered by the United States, Russia, and Jordan, they are far from certain to lead to a lasting end to violence between the regime and the opposition in the south. Southern Syria encompasses the deserts of Homs and Damascus provinces, the Hawran plain including Suweida and Daraa provinces, and the Quneitra hills southwest of Damascus city. In addition to its symbolism as the birthplace of the Syrian uprising in 2011, southern Syria’s significance lies in its proximity to Israel, Jordan, and the Syrian capital. This makes it a critical geography for the conflict’s key participants. The Syrian regime and Iran understand that a south held by hostile forces would pose a permanent threat from insurgents who could be coopted by the United States, Jordan, and perhaps Israel. The Hawran area in the south is also historically important to the Alawite-dominated regime as it provided important Sunni support. It is home to most of Syria’s Druze who, as a minority, have also helped legitimize the regime as a cross-sectarian protector of minorities. Thus, to the regime, losing the south means ceding control of Syria’s borders, inviting foreign intervention, losing key constituencies, and facing open-ended insurgent pressure on the capital. It cannot accept such an outcome, even if it temporarily tolerates it due to limited resources and competing priorities. Russia’s interest in the south overlaps with the regime’s single-minded focus on survival. لم تُثر الحرب الدائرة في الجنوب السوري انتباه الإعام والمحللن بالقدر الذي أثارته تلك الدائرة في المناطق الشمالية من الباد، علماً أن أهمية الصراع على الجنوب توازي أهمية الحرب في الشمال مع كل ما تشهده هذه الأخرة من اجتياحات برية تركية وضربات جوية روسية وحملة عسكرية تقودها الولايات المتحدة ضدّ داعش. ومن المرجح أن تتسبب هي أيضاً بصراع دولي وتسفر عن تغيرات تطال الجغرافيا السياسية في المنطقة. وعلى الرغم من اتفاقات الهدنة الي تمّ التوصل إليها مؤخراً بوساطة الولايات المتحدة وروسيا والأردن، ما تزال هذه الاتفاقات بعيدة كل البعد عن وضع حدّ نهائي للعنف الدائر بن النظام والمعارضة في الجنوب.